June 15, 2010. DFI* Peter Keyes, on a continuing search for his own Dolphin, discovered #206 in a well known Dolphin hiding place - the back lot of a boat yard. In this case, the Underwood Boat Yard in Eugene, Oregon. 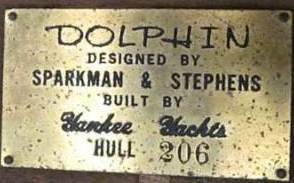 This yard also is the home to 2 other Dolphins, Don Barnett's Casandra Rose, O'Day #56, and David Etherington's Dolphin, Yankee #193. Click on the names to go to them. We are hoping to hear soon from owner Rob Tabb with more information about #206. This is our 158th 'found" Dolphin. Click here to find out more about our Number of Dolphins Found project. Here is Peter's report and photos. We corresponded a bit last October - I'm the guy in the NW with the Wm. Garden Eel (photo at left) who might be looking for a Dolphin. I'm still interested, but many things have slowed down any movement on boats - such as a bike crash that broke enough body parts to slow me down for 2 months. I've been in contact with Warren Levine in the Bay Area about his boat (which looks very nice), but I realized that all my interest in Dolphins was theoretical, and that I should see one in person before I headed off on longdistances to check one out. So looking into a local boat storage yard, I spotted Don Barnett's, Cassandra Rose, and went back today to see it up close. And hidden away in the back, there was an unknown - Hull no.206. I've attach some pictures. It looks like a gut remodel to me, which I just don't have the energy to do. The owner may be coming to the realization that he doesn't either, so it does seem to be on the market. The good thing about seeing this boat was I was convinced that this is a great size for us - the cabin is just right, cockpit fine, can be pulled by my F-150, etc. So I'm going to keep looking in a desultory way. 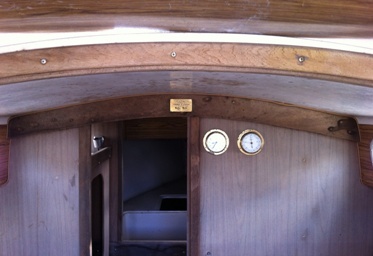 I like the era of Warren's boat - the Yankee's that still had wood trim, coamings and hatches. 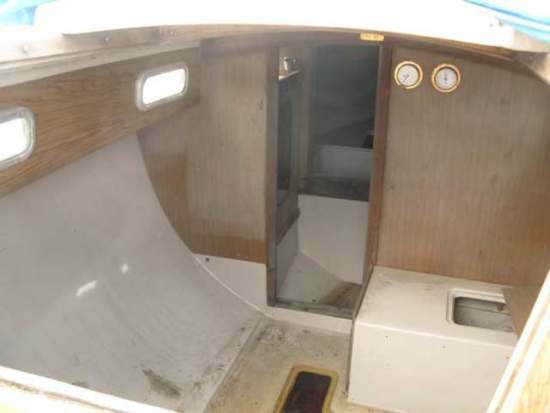 I don't like dinette berths, but based on what I've seen, it should be possible to move/cut down the galley and make one quarter berth on the port side. 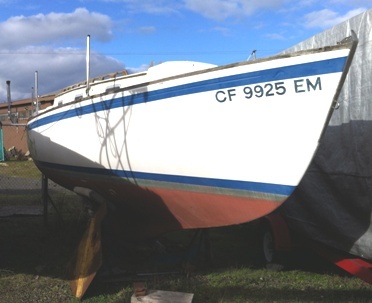 My inclination would be to buy one from this era in good shape, but given everything else I have to do now (like move up to Whidbey for the summer and get the Eel in the water) I'm not sure I'll make it to the Bay Area, and then have to get a trailer made for that boat, etc. 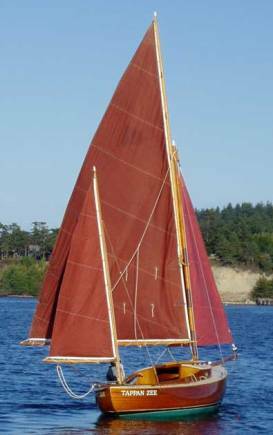 If one of the NW boats from this era (Yankee Girl Esther, Thistle, Parakletos) ever came on the market, I'd be very interested, but they all seem like very long shots. Anyway, I'm glad to have done my part in support of the Great Dolphin 24 Quest, as partial payback for all the fantastic information and insights I've gotten from your website! Hope you're having some great sailing weather back east, and I'll be in touch if there's any movement on my part here. 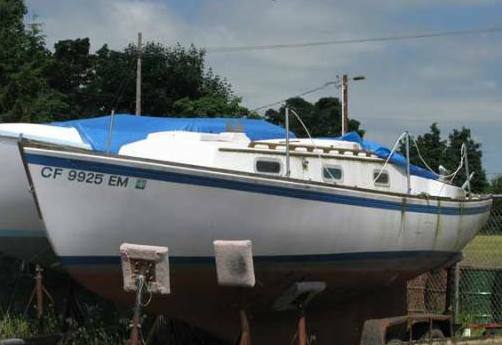 I just happened to be down at the boatyard in Eugene, Oregon where poor nameless hull 206 rests. Depressing, but maybe not totally hopeless. She's the dream of some (poor sob) guy who hasn't even heard of Dolphins yet. Anyhow, I snapped a couple photos, neither very good (she's tucked in between other boats).